Every dog parent has had to leave their pup behind at home or drop them off at doggie daycare in order to run errands at one time or another. After all, many stores don’t allow pets other than service animals inside. But what if you could take your pup shopping with you, even if he’s not a service dog? In fact, you can do just that at numerous major chain stores, from Academy Sports + Outdoors to West Elm. Below, we’ve rounded up 35 of these stores that generally allow pets–whether they’re service animals or not. But before we get to the list, we have to give a necessary caveat: Even if a company is generally pet-friendly, it’s usually up to the manager to decide whether or not to allow non-service animals in an individual store. As a result, policies can differ from one store to another or change when management changes. If you’d like to take Rover shopping, your best bet is to call ahead to the store and confirm their pet-friendly policy. 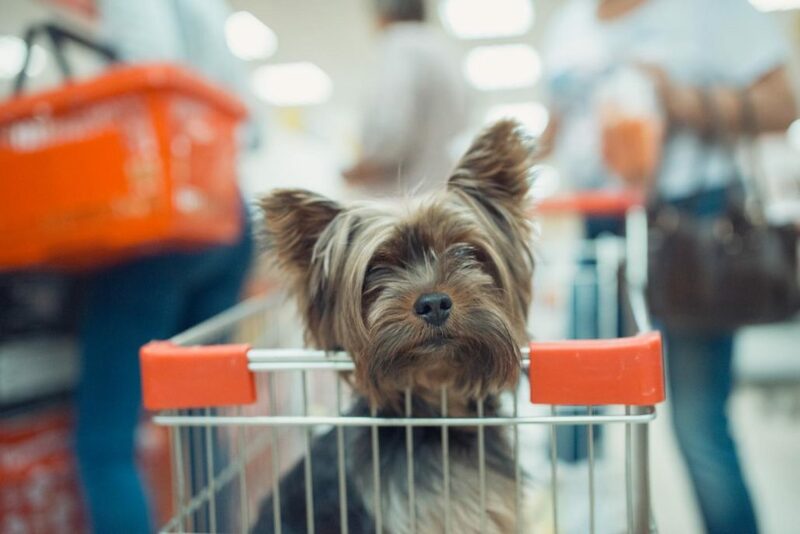 Without further ado, here are the 35 stores–separated by category–where you can bring your dog, plus tips for taking your canine companion shopping. Everyone needs a trusty friend along while they’re trying on clothes, so why not bring your favorite canine companion to give her opinion? But your pup will probably smile in approval at whatever you try on, so don’t expect them to be too critical of the latest styles at these retailers. Your dog may not wear makeup or crave a bath bomb after a long work week, but they can help you shop for them at these popular beauty stores. Just make sure they don’t try to sample any of the products, as dogs explore the world around them by smelling and licking objects and these stores are usually full of new and enticing smells that will excite your pup. Should you read a romance or mystery novel or get the latest nonfiction bestseller? Your dog can’t read, but he can help you pick out your next book at these bookstores. In fact, he’ll probably convince you to pick up a heartwarming novel about dogs while you’re at it—just don’t try to bring him into the in-store cafe, as they don’t usually allow pets. You can never find the bead or the yarn aisle when you need to buy them for your next project, but your pup can help you sniff out these supplies at popular craft stores Hobby Lobby and Michaels. Make things meta and decide on a pet-themed craft project—perhaps a photo collage of your favorite puppy pictures? Upscale department stores aren’t the first thing that come to mind when you think of pet-friendly retailers, but several major anchor stores allow dogs. Just keep in mind that not every store in the mall is equally pet-friendly, so plan accordingly. Home Depot and Lowe’s are some of the most well-known stores with a pet-friendly policy and some locations have allowed dogs to go shopping with their owners for literally years. Tractor Supply Co. takes their pet-friendly policy one step further and actually offers PetVet preventative clinics at certain locations, so your dog can get caught up on his vaccinations while you shop. We all know that that second couch you’re looking to buy is really just a second dog bed, so why not take your pup along to help you pick it out? These three upscale home decor stores are all dog friendly—just don’t actually let your pup test out the furniture in store and be mindful of any breakable knickknacks located at dog-level. What would a pet store be without a pet-friendly policy? Two of the biggest chains in pet care, Petco and PetSmart, both allow dogs inside (as well as other more unusual pets, including sugar gliders and pot-bellied pigs). 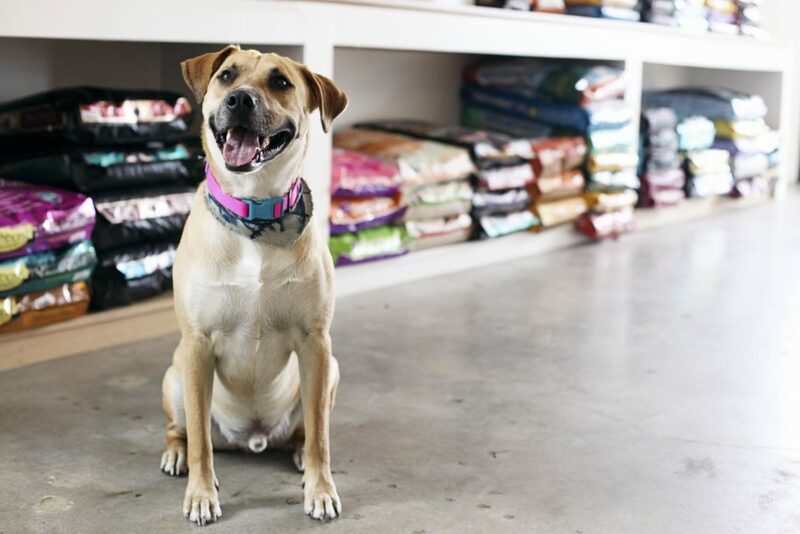 Out of all the categories listed here, your pup will probably have the most fun shopping at these stores, as he can help you pick out new dog toys and treats. While some stores in this category might be surprising, your pup can help you shop for anything from computers to shoes to cards to diamond jewelry. Since you’re there, perhaps you should pick up an extra-luxurious leather collar in Tiffany blue to show just how much you love your pup? Sports and outdoor retailers are a natural fit for pet-friendly policies, as many dog parents like to take their pups hiking, camping or kayaking, just to name a few popular outdoor activities. Bass Pro Shops even hosts family-friendly Dog Days events in the spring, so check to see if your local store will be participating this year. Generally speaking, your dog must be properly secured in order to enter these stores, which means a harness or a leash or possibly a carrier for smaller dogs. Stores often require that all pets be up-to-date on their vaccinations as well (but then again, your dog should already be caught up anyway). While some dogs are perfectly fine without any training, other pups can find shopping an anxiety-inducing experience. Everything looks, smells and feels different, and the aisles block dogs’ line of sight. To test out your dog’s feelings, take him on a walk in an area with heavy pedestrian traffic. This will let you see how your dog reacts without the added complication of store shelves. When your dog is ready to proceed, a pet store is a great introduction to shopping indoors. It will look and smell familiar, giving your pup less to get acclimated to. Try to visit the store at off-peak hours when there won’t be as much foot traffic, which makes the experience more relaxing for both you and your puppy. You can then experiment with other types of stores once your dog gets comfortable. Shopping with your dog can be a fun experience for both of you as long as you prepare properly. Make sure to call the store(s) ahead of time to confirm their pet policy, and don’t forget to reward your pup’s good behavior with a dog treat or even a fun purchase just for them. Jordan Smith is a full-time stay-at-home mother of 2 daughters and a new dog Luna! She loves blogging, crafting, and spending time with her family. She also enjoys strolling the streets of downtown Charleston, South Carolina and all the amazing food her hometown has to offer.